The first race of the series was held on 3rd December at Southbank. 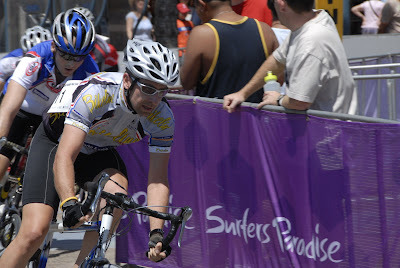 It was a very hot and humid day and the racing was expected to be just as HOT. Brady was our sole competitor and he showed us what it’s all about finishing in a photo finish to claim 4th. This was an awesome race filled with action, with a number of crashes, break aways and a lot of speed. Brady was cheered on by a very vocal crowd which ventured down to Brisbane for the big day. The following weekend on the 10th the second race of the series was held at Surfers Paradise, this course is known to many as fierce. There are many tight corners and cobbles as well. The pace was red hot and riders were dropping like flies, Brady held on to claim 4th again – this was an extremely tough race and Brady deserves a huge accolade for hanging in there. Good on ya, Mate! !